Production Components adds two more manufacturers to our line-up. R&I Manufacturing from Terryville, CT.
Fortville Feeders, Inc. is a leader in the design, manufacturing and supply of automated parts feeder systems. They have been on the cutting edge of solutions for the automation industry since 1979. They are known in the industry as The Parts Handling Specialists. With over 30 years of experience in the automation industry, they design systems and components for all industries, including Medical, Home Goods, Automotive and Consumer Products. Apart for their primary components, they provide isolation ancillary components for nearly 80% of their systems. These include, escapements, cross shuttles, star wheels, escape and blow, rotary actuators, etc. Feeder systems are often over simplified in their function of material handling. Many suppliers will leave customers with the complete responsibility of the part after it has completed its feeder journey. Fortville strive to be sure that the transition from the feeder to you is a clean flawless transfer. Whether you’re an end user looking to decrease your material handling or an OEM putting a feeder in a machine with your company’s name on it, Fortville Feeders, Inc. offers the quality, reliable product you are looking for. 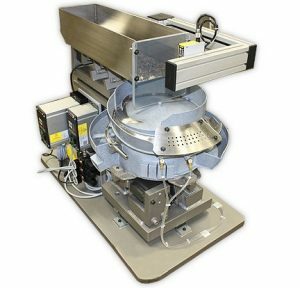 In 1968, R & I Manufacturing Company started out with a single product called the DURA-SLIDE linear positioning device. It was a tough, economical unit designed for the small parts assembly operation. Since then, the product line has grown, along with the company’s reputation for high-quality, low-cost part placement devices. 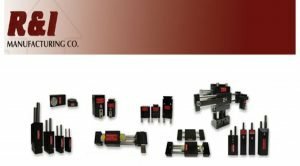 From automatic parts to intricate electronic components, R & I grippers, escapements, slides and pick-and-place units working hand-in-hand with the leading names in the automatic assembly business. Today, R & I Manufacturing has a nationwide network of sales and application technicians ready to assist you with your automatic assembly needs. If they don’t have a unit that will do the job, they have the experience to customize one. That’s why it is said they are “America’s Partner in Assembly Automation”. DURA-GRIP Part Placement Devices are designed to provide a low cost gripping unit for use on transfer mechanisms. These air operated units grip parts internally or externally offering the designer a wide latitude in finger tooling arrangements. Available in two or three finger grip models, DURA-GRIP units are ruggedly constructed with a minimum of moving parts. Utility tapped holes permit mounting the unit from the top or the side with additional cap styles for dovetail mounting. These same holes can be used to mount “stripper” devices too. The body is anodized high strength aluminum, fingers are hardened tool steel. Maximum pressure, 100 psi. HD heads are available in all sizes of the GH series. These heads’ toggle linkages are arranged to have the inward motion of the finger occur on the full (bore) side of the piston. An optional finger positioning sensor is available on all heads. The built-in proximity switch can be set to indicate either fingers opened or fingers closed. All units are shipped completely assembled, ready for mounting and attaching tooling. This entry was posted in Uncategorized on October 19, 2017 by Prodcomp1.